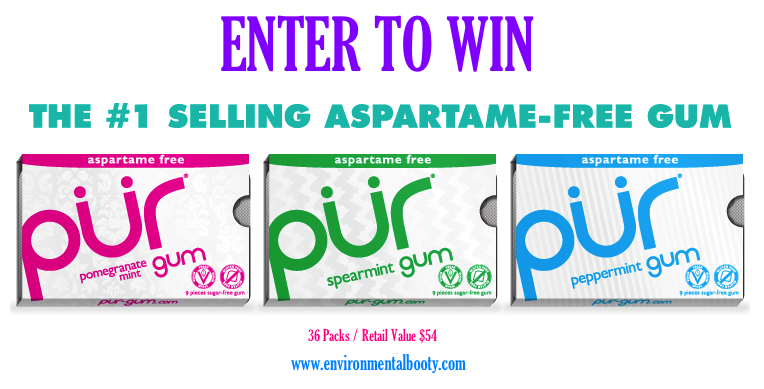 Win and Go Aspartame Free for Your Health, Chew PUR Gum for Your Taste-buds! I started my company four years ago because of a health scare from the chemical sweetener aspartame which the FDA reports consumer complaints link to over 92 illnesses. Since that time, I have sought out aspartame free foods and drinks which has been a challenge considering aspartame is in thousands of foods and drinks! When I found PUR gum, my family and I fell in love with the long lasting taste and healthy ingredients. Sweetneed with Xylitol, a naturally-occurring sugar alcohol found in corn cobs and stalks and infused with antioxidants, PÜR is vegan friendly, gluten-free, naturally colored and flavored as well as free of genetically modified organisms (GMO). It's easy to win our PUR Gum Giveaway. Just leave a comment below telling us what you think your favorite flavor of PUR gum will be: fruity Pomegranate Mint, the fresh taste of Spearmint, or the cooling sensation of Peppermint. Then, register your entry on the Rafflecopter entry form below and you will iunlock more chances to win!